The ISIA of Faenza, as all other Institutes of this type in Italy, (located in Florence, Rome and Urbino), focuses on product and communication design. It awards first and second-level academic diplomas, which to the purpose of public competitions, hold equivalent value to corresponding university degrees. Founded in 1980 with the aim of providing advanced training focused on the ceramic sector, the institute has since broadened its sphere of activity to encompass the complex fields of Design and Communication. 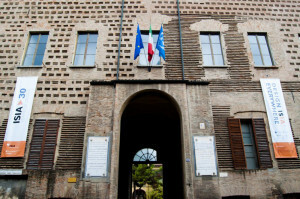 The Institute has maintained a particular focus on formal research and advanced technological research connected to the field of ceramic production and the traditional culture of the city of Faenza. One of the most valued qualities of the Higher Institute for Artistic industries in Faenza is the intensity and direct nature of relations with the world of industry and research, through design professionals, experts from the sector and University professors. The ISIA in Faenza collaborates with the following companies: Tognana, Richard Ginori, Gamma due, Alessi, Metalplast; FIAT, INDA, Cefla, iGuzzini, Bodies such as the Polo Ceramico and ISTEC-C.N.R., Faenza. There are active ERASMUS exchanges throughout 21 countries. The institute has the right, as all institutes of higher learning, to establish its own regulations and organs, elected by Professors and Students. This foresees autonomy in the choice of professors, the creation of syllabi, research and the development of initiatives connecting the institute to industries and bodies. The ISIA is governed by a board of directors with financial responsibilities and by an Academic Council responsible for teaching and research. The Institute is represented by a President selected by the Academic Council, as proposed by the Ministry for Education, governed by a Director elected by Professors.